From dragons and fish to mountains and rivers, the motifs embroidered on the Bouyei’s traditional dress are deeply symbolic and all harken back to their religious beliefs. Young Bouyei men tend to wear short, long-sleeved jackets that button down the front accompanied by long trousers, with scarves made of black or lattice cloth wrapped around their heads. Their clothes may seem somewhat underwhelming, but the Bouyei women’s superior fashion sense more than makes up for it! Their traditional dress is incredibly varied and depends on what region they live in. 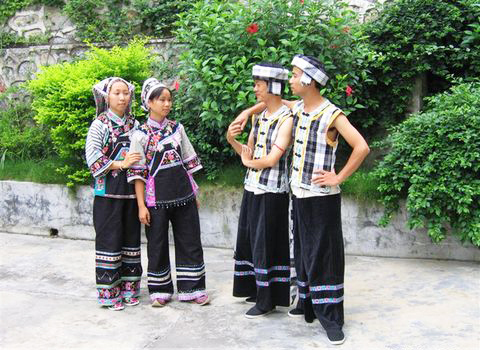 In Guizhou they can roughly be split into four styles: Northwest, Southwest, Central, and Eastern. In the Northwest, the women prefer a short black jacket that is secured on the left side by a band rather than buttons. This jacket will be beautifully decorated at the cuffs and on the front with batik patterns, and is complemented by a pleated skirt made of batik cloth. This is accompanied by a turban and glittering silver jewellery. And, if you want to know whether that pretty Bouyei girl is married or not, just look at her apron! Unmarried women will wear a plain apron, while married women wear aprons that have been embroidered with a floral pattern. The Central-style is characterised by long, green trousers and an abundance of silver ornaments, including hairpins, earrings and bracelets. Women who live in the Southwest will either wear trousers with a long-sleeved blue jacket or a coat with a long, pleated batik skirt. The sleeves, front, and shoulders of the coat are normally bedecked with either batik or embroidery, making the Southwest-style the most elaborately decorated of them all! 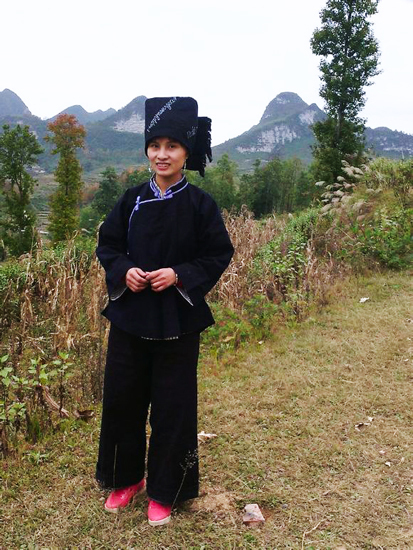 Finally, the long term contact in the East with the Han ethnic majority has meant the Eastern-style differs very little from the Han traditional dress. Here the women wear a dress and trousers, both trimmed in lace, accompanied by a turban. In Zhenning County, Guizhou province, the Bouyei women sometimes wear a special type of hat known as a jiagu. This hat is made by wrapping batik fabric around a bamboo shell-shaped frame but only certain women are allowed to wear it. Unmarried women will braid their hair and then partially or fully cover it with a black, embroidered turban. 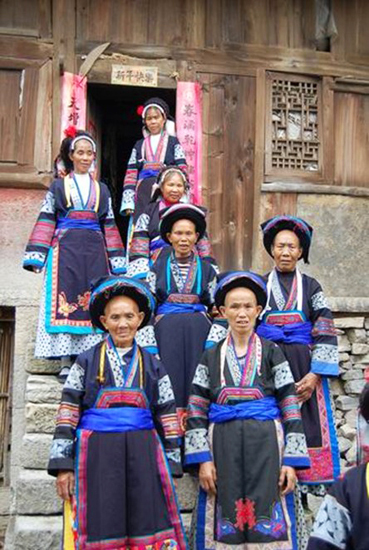 However, only when a married woman has returned to her husband’s home and given birth to their first child will she wear the traditional jiagu. 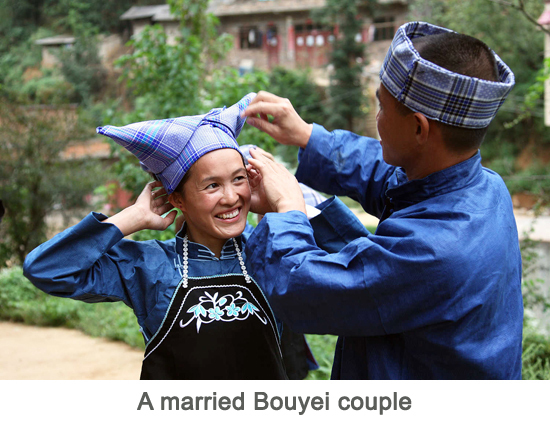 In Bouyei culture, husbands and wives can remain separated after their wedding for up to 8 years! So it’s unsurprising that this special hat means so much to them. 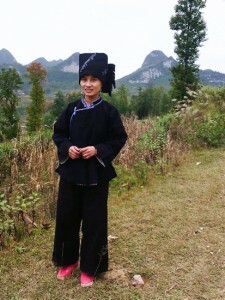 Once a married woman has put on the jiagu, she must officially leave her parent’s home and go to live with her husband. Many married girls enjoy continuing their free lifestyle and so refuse to wear the jiagu, much to the chagrin of their husbands. So these women are often the target of tricky surprise attacks! Every year, during April, August or September, the man’s mother and sister, or two of his female relatives, will bring a chicken and a jiagu to his wife’s home. While they are there, they will sneakily try to unclasp her hair and put the jiagu on her head! If they are successful, she must return with them to her husband’s home. If not, they have to try again another time. In some cases, it is also acceptable for the husband to simply creep up on his wife and un-braid her hair. So next time you’re looking for a date in a local bar, just try popping a hat on the girl’s head! Batik: A cloth-dying process whereby a knife that has been dipped in hot wax is used to draw a pattern onto the cloth. The cloth is then boiled in dye, which melts the wax. Once the wax has melted off, the cloth is removed from the boiling dye. The rest of the cloth will be coloured by the dye but the pattern under the wax will have remained the original colour of the cloth.